On the sleek platforms of the Sai Ying Pun MTR station, trains speed past every few minutes, but another world awaits above the station. You can smell it in the tunnels even before you emerge onto the streets; the pungent smell of the sea rushes down the escalator passageway, followed by the creaking sound of rusted trolleys clamouring along the pavement. Labourers in stained, loose sleeveless undershirts shout impatiently at passersby, their voices hoarse: “Tai2 lou6 aa1!” (睇路呀 “Watch where you are going”). They have been unloading boxes of dried seafood products since the early morning. 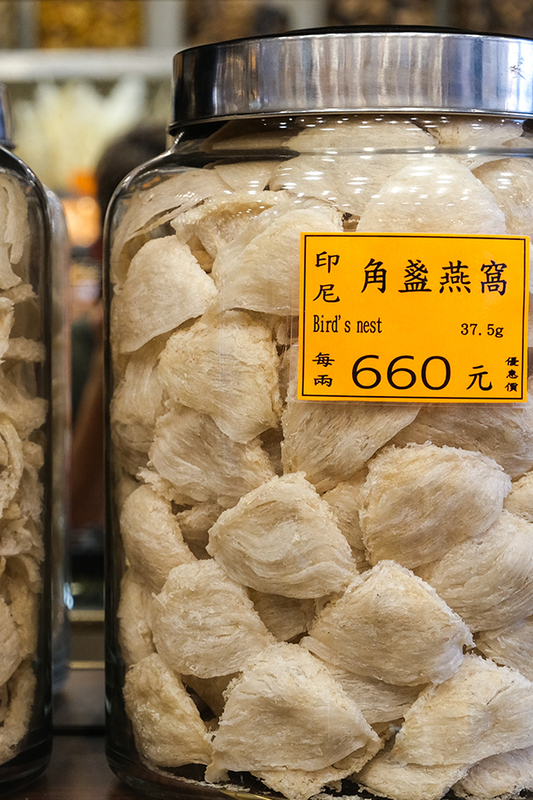 Fresh seafood is an cherished part of Cantonese cooking, but dried seafood has its own particular role to play. 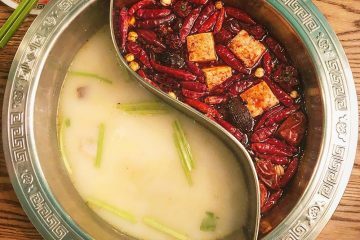 The dehydration process concentrates the distinctive savoury fragrance and subtle sweetness of seafood, which can be soaked to re-soften before being simmered in broth to create exquisite dishes, especially during festive occasions when families are willing to splurge. This is Dried Seafood Street (hoi2 mei6 gaai1 海味街), which is especially busy during Chinese New Year. Second-generation shopowner Chan Pui-kit still remembers being awed by the crowds during his youth. “You couldn’t even walk!” he exclaims. 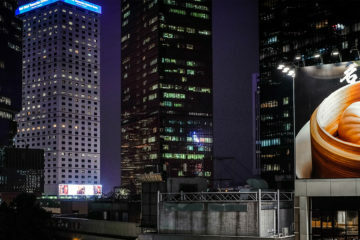 It’s a tradition that goes back to Hong Kong’s very first days as a city. After the First Opium War, when the defeated Qing Dynasty (1644-1912) handed Hong Kong over to the British Empire, the island’s new rulers chose its northern shore for development, thanks to Victoria Harbour, whose deep waters facilitated international trade. British, American and European traders and government officials established themselves in Central, while Chinese merchants set up shop in the western districts of Sheung Wan and Sai Wan, dealing daily staples like rice, medicinal herbs and dried seafood to Hong Kong’s burgeoning population of Chinese workers. Many of these goods were related to the Nam Pak Hong, a catchphrase that referred to trade between trading houses (hong6 行) based in the south (naam4 南) and the north (bak1 北). One of the reasons the British had been interested in acquiring Hong Kong was to break the trade monopoly of Canton — today known as Guangzhou — which had been designated as China’s only foreign trading hub in 1757. 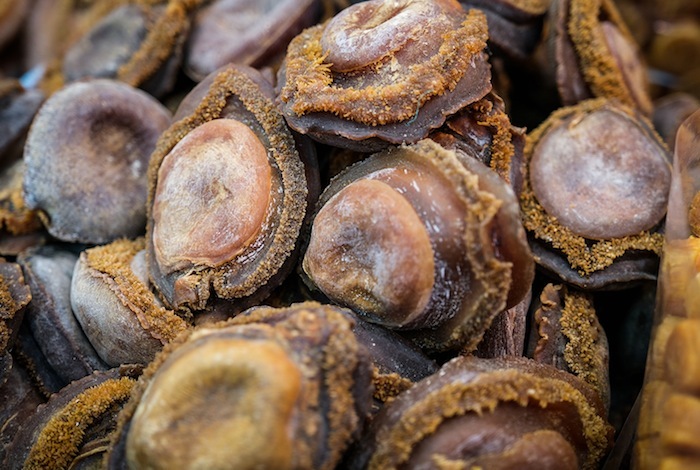 Tea leaves, medicinal products and dried seafood from the north of China were shipped to Canton and then out to the rest of the world, while the port also received inbound products from Southeast Asia, including rice, spices, bamboo homeware, coconuts and tree glue, along with some dried seafood. After Hong Kong became a British colony, Chinese entrepreneurs used it as a base to expand their operations, and in 1868 the Nam Pak Hong Association was established to represent their interests. 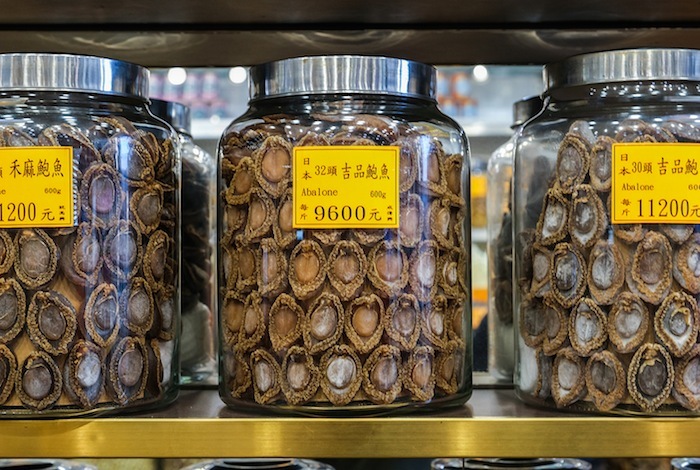 In heydays of the trade, more than a hundred dried seafood and Chinese medicine shops were set up in Bonham East and West, Wing Lok Street, Des Voeux Road West and Ko Shing Street. Initiated and populated mostly by Chiu Chow businessmen, the Nam Pak Hong rapidly developed into a prosperous community with its own security, time-keeping and firefighting teams. Eventually, however, the community began to splinter as more prosperous businesses moved elsewhere, leaving behind the traditional trades of salted fish production — aimed at a working-class market — and dried seafood, which catered to more affluent groups. 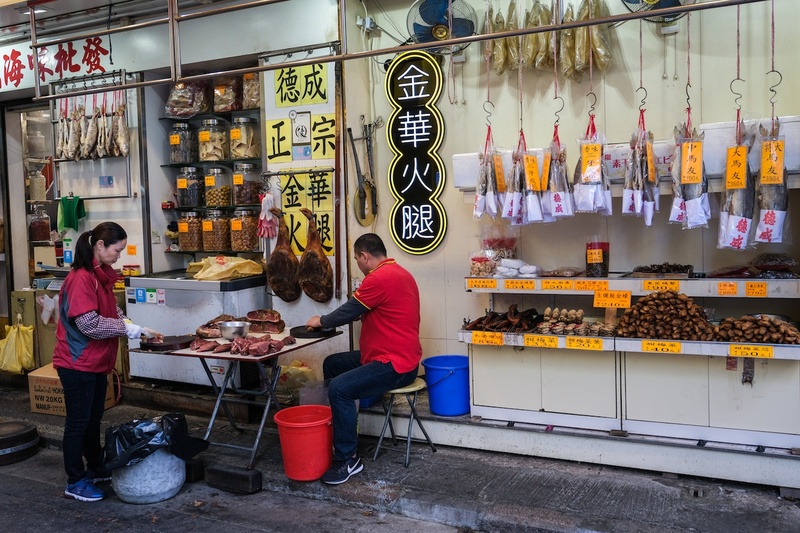 The area around Des Voeux Road West became known as the Salted Fish Compound (haam4 jyu4 laan4 鹹魚欄) in the early 20th century, which eventually morphed into today’s nickname of Dried Seafood Street as Hong Kong became more prosperous and fewer people ate salted fish. Today, many of the area’s businesses seem frozen in time – what people refer to as “old name” businesses (lou5 zi6 hou6 老字號). Among them is a pair of shops in a four-storey tenement building owned by a father-son duo who have witnessed the transformation of their historic street through the generations. Chan Fai, the father, who is now an octogenarian, is originally from Xinhui District in Guangdong (also known as Sun Wui). 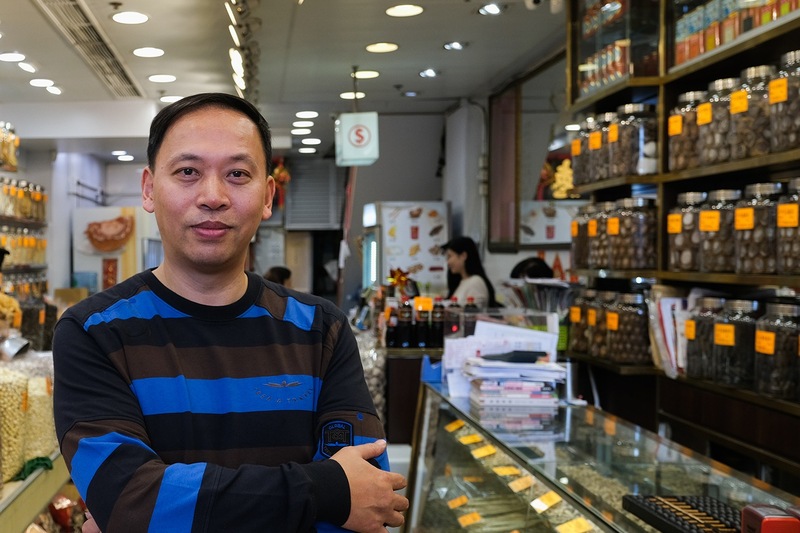 When he first came to Hong Kong, he worked in a number of dried seafood shops before setting up his own business, Wing Lee Seafood Products, in the 1960s. 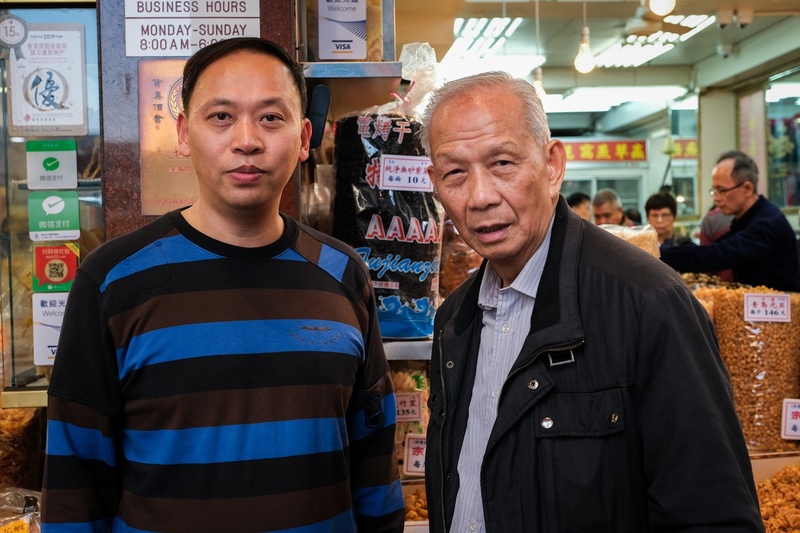 His son, Chan Pui-kit, owns the more modern Tak Shing Seafood Products next door. “It wasn’t easy to look for a job in the ‘50s and ‘60s, after the war,” explains Chan Pui-kit. His father’s friends from Xinhui were already involved in the seafood trade, so he joined them. Wing Lee still retains a lot of features common to old Hong Kong shops. Red lampshades casting an alluring glow over the dried seafood facing the street. Inside, a huge black plaque adorned with bright red ribbons and gilded with the shop’s Chinese name, Wing5 Lei6 (永利), hangs high above in the centre of the shop, which is flanked by tall white sacks of various types of seafood. 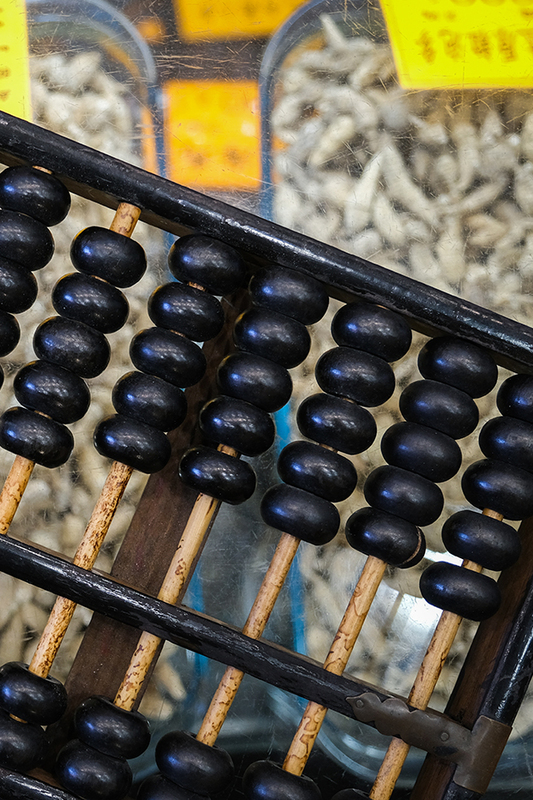 Manning the cashier is the austere shop manager, whose fingers flicker between the black beads of his abacus. In the past, the shop was only operated by men, but women now work there too. 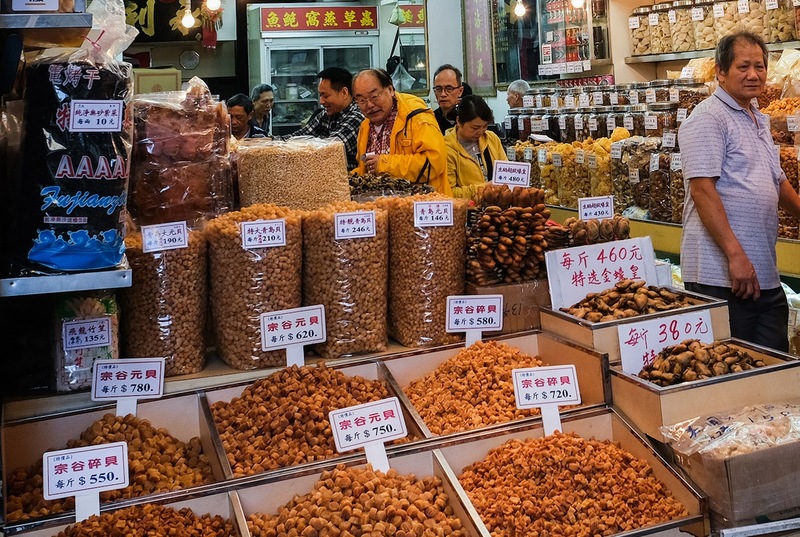 In the early days, Wing Lee sold small dried sea shrimps, dried oysters and non-seafood groceries such as shiitakes, beans and rice to local residents. “In the ‘60s, there wasn’t a wide variety of products to sell,” says Chan Pui-kit. 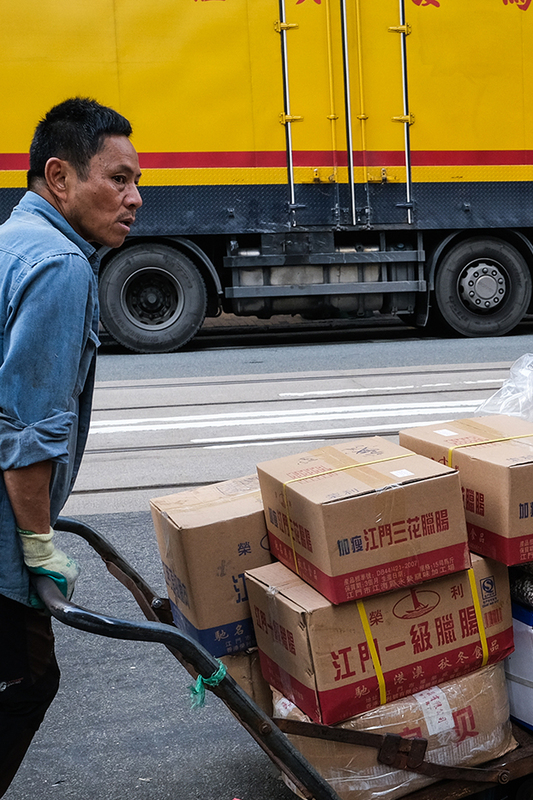 “The technology in refrigerating edible goods wasn’t as advanced and so we mainly imported what could be transported from the mainland before they went bad.” But the boom years in the 1980s saw a shift in the market. 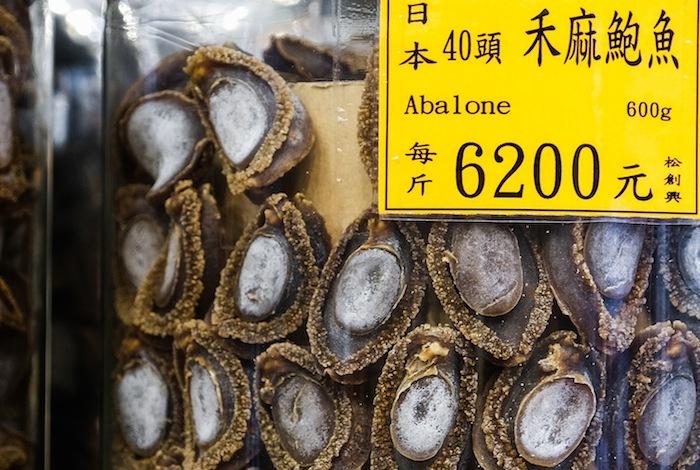 Newly affluent customers wanted seafood that had been previously unaffordable, and demand for abalone, sea cucumbers, shark fin, fish maw, oysters and scallops soared. Advances in refrigeration and shipping technology made it possible to meet the demand. In the 1960s, it took around three months to transport the products, untreated with preservatives, from foreign ports to local destinations. But refrigerated container shipping sped up the process and prevented spoilage. 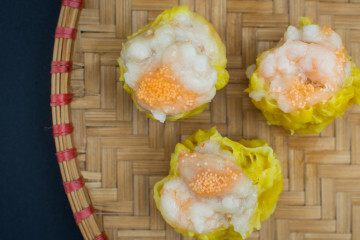 Riding the wave of increased seafood consumption, Chan Fai set up two more branches of his business, including Tak Shing Seafood Product next door, which he handed over to Chan Pui-kit in 1997. Now his own boss, Chan has retooled the inherited family business for the modern market without sacrificing its more traditional characteristics. In 2010, he published a book called Sea Treasures to preserve his family’s memories and dried seafood recipes, promoting the history of the traditional trade to a new generation of Hongkongers. Chan has also changed his offering. While his father continues to focus on products sourced locally or from nearby regions, Chan travels around the world to source particularly rare kinds of seafood. “Lately, local foodies have acquired a more exotic and expensive taste,” he says. 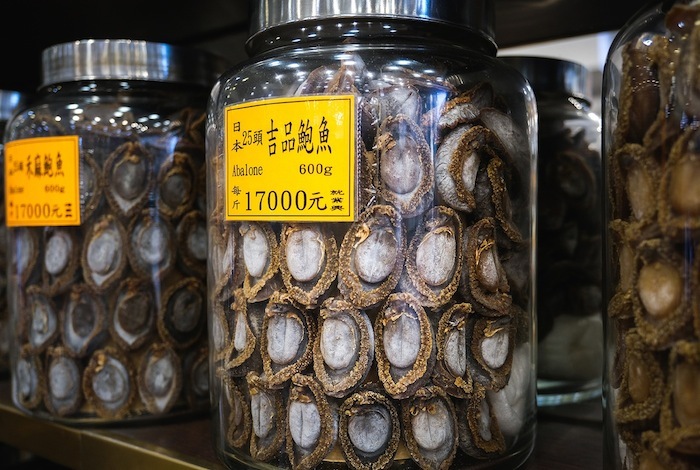 Chan has stocked up on sea cucumbers from extreme far corners of Siberia, sweet scallops from Hokkaido, hasmas from China’s Heilongjiang province, caterpillar fungi from Tibet and Jilin velvet antlers. That becomes especially clear in the lead-up to Chinese New Year, when the crowds on Dried Seafood Street grow especially thick. 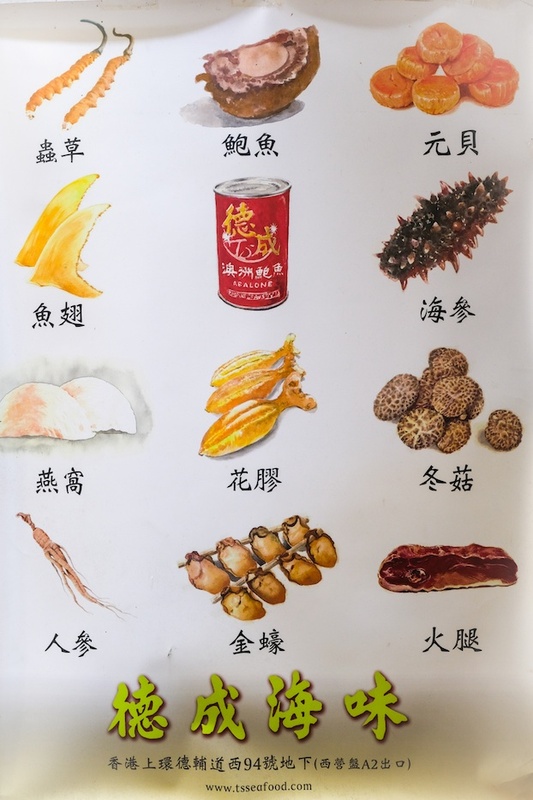 Dried seafood is popular in Chinese New Year dishes because it is a rare, expensive treat, but also because a lot of the seafood names are phonetically similar to auspicious blessings in Cantonese. 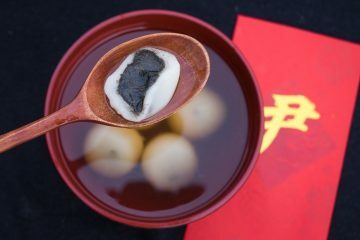 One signature dish is Black Sea Moss with Dried Oysters (faat3 coi3 hou4 si6 髮菜蠔豉), which resembles the Cantonese wish for “good fortune and good things” (faat3 coi4 hou2 si6 發財好事). 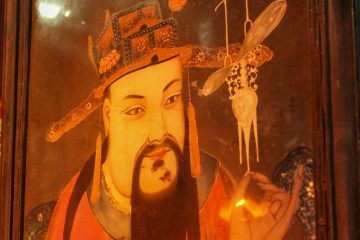 Another famous example is the Whole Handful of Gold and Money (gam1 cin4 mun5 zoeng2 金錢滿掌), which is made of fish maws, preserved ham and shiitakes, which symbolise treasure carried in one’s hands, represented by slow-cooked goose feet. The crowds keep growing. Chan steps away to serve the flood of customers perusing his selection of dried goods. Next door, his father is busy tending on old customers who return for the same ingredients they have been buying their families for years. The two shops form a montage of two generations, each piecing together different flavours, images, times and memories from over the century. And on the eve of another Chinese New Year, new changes — and new flavours — await. 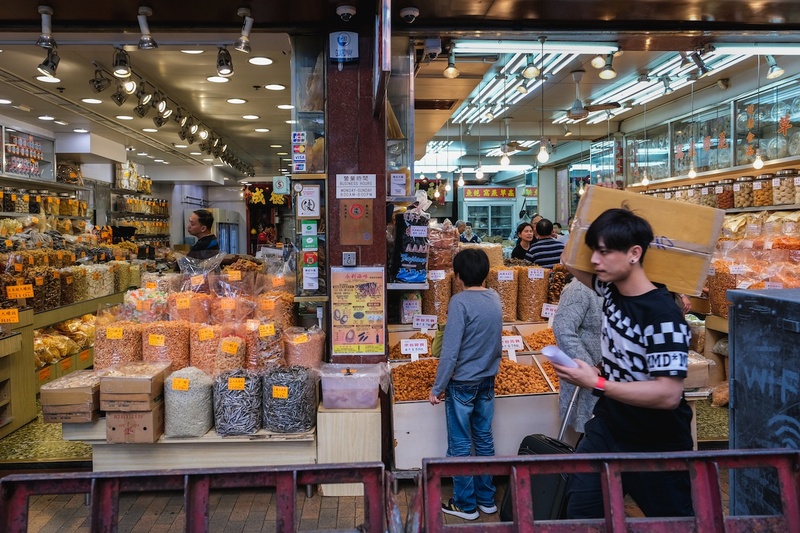 A father-son duo has witnessed the changing tastes and traditions of Hong Kong's famous Dried Seafood Street.